Punjabi Jutti is a famous type of footwear for Punjabi Community, especially in Northern Indian regions and adjoining areas. This traditional footwear is a trademark of my town, Malout, from where it is exported across the globe, especially for Punjabi diaspora. Royal families and wealthy Punjabis traditionally wore this ethnic shoe. They used to wear variants, rich in golden threads and colorful beads. These variants are even popular today and have become competition to the modern shoes industry in India. Handcrafted Jutti are very famous among rural folks and are gradually becoming a symbol of fashion given to ease of comfort, extensive embroidery, in real gold and silver thread, with charming appeal. Malout boasts a large number of home-based shops from where the footwear reaches every nook and corner of Punjab and even abroad. People visit my hometown just to purchase Jutti for their children or relatives as a token of love, which is presented to them on special occasions or festivals. 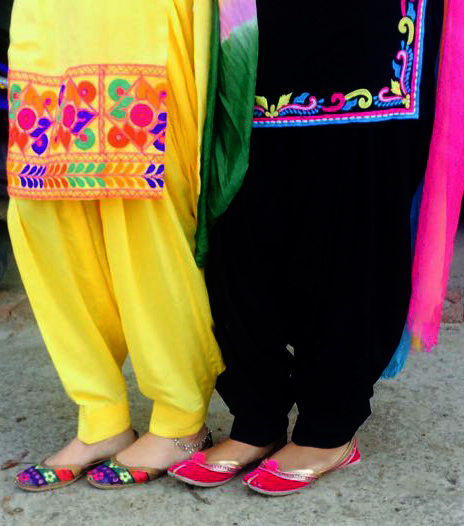 And, no marriage function is deemed complete in Punjabi wedding ceremonies unless Punjabi Jutti are worn. People engaged in shoemaking in Punjab hail from the poor class of society. Talent has been passed from one generation to the next. But, the youngsters of this generation are not readily accepting the profession, apparently because of the hard work involved, tough embroidery work in the manufacturing process, and the modest living one can make from this trade.